layer your winter wear - Begin Prepping Now!! As cold as it’s been, you may just feel like wearing every piece of clothing you own, but that really isn’t necessary. I will teach you how to layer clothes to survive the cold weather. 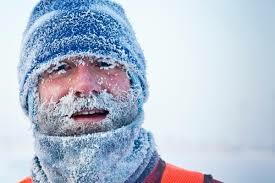 It is important to understand layering to retain heat, reduce sweating and stay dry and comfortable. 1) Touching skin: The main job of this layer is to wick sweat away from your skin, then dry quickly so you don’t get chilled. 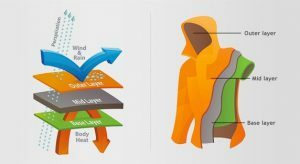 Synthetic materials (polyesters) make good base layers, and people with very sensitive skin often find wool itchy, so poly is a good wicking, quick-drying option. My favorite is the wool/synthetic blends which are becoming more popular because they have the quick-dry ability of synthetics, with the warmth and anti-stink talents of wool. Some prefer a base layer are pure wool. They are very efficient- warm when it’s cold out and cool when it’s hot. They also don’t stink up like so many synthetics do. The con is that wool tends to dry slowly when it gets wet (either from precip or sweat). Cotton takes forever to dry which makes it a bad base. A note about fit: For cool or cold weather, your base layer should be snug, because if it’s not touching your skin, it can’t wick sweat. That means your sweat sits on your skin until it evaporates, which leaves you shivering. 2) Insulation: This is the layer that traps your body heat. It usually consists of lightweight fleeces, heavy shirts and wool sweaters. It just depends on the season. This layer can be taken off and put on easily as the temperatures change so your body heat can escape and dissipate. As soon as you stop moving around, put it on so you won’t get cold as your sweat dries. For daily wearing most any winter weight clothing works well here. 3) Coat: A coat can vary from a jacket to a ski parka but you should always have a coat suitable for the nighttime temperatures of the current season. Remember that you should be prepared for emergencies. If it’s a nice day and you leave your coat in the car, it’s no big deal. If you leave your coat on the couch, then get a flat tire on the way home…you could be in real trouble. 4) Shell: A shell has two jobs- to cut the wind and keep you dry. In summertime, you can get away with a wispy windshell, but for more challenging weather and extended trips, you want a waterproof/breathable shell (like Gore-Tex or eVent) that keeps water out, but let’s sweat escape. You don’t want moisture from perspiration inside your layering system. The guiding principle of layering is that you are regularly adding and removing layers to keep your body temperature even. I wear my base layer and a light fleece most of the winter. As my body warms up, I may remove the fleece. If a breeze picks up or I’m in the shade, I put the fleece back on, and possibly my outer shell . This is the layer that changes most often. I always make sure my extra layers are conveniently located so I can reach them. It is always important to be prepared for the weather and possibilities of the life you lead. Layering clothes is a simple safe practice to begin. If your job is one that requires you to wear business clothes, be sure to have a bag with sturdy layering clothes and comfortable lace up shoes in your car and office. You should have practical attire close at hand at all times. I’ve lived in the cold of the midwest my whole life, so I know a little about keeping warm. It’s getting the kids to stay bundled up that is the challenge! For sure! Getting them to bundle up and keeping track of all the extra stuff is a challenge. But it is worth the effort. Whew. this has been a weird winter already. In NC anyways. Frigid temps then back to the 70s this week. the thing is that your morning starts off cold and then it is up to practically shorts weather by 2PM! You have to dress in layers. Plus you can be cold in the shade and start sweating while in the sun!! But I love the Carolinas… but I digress…great article. I have never really paid to much attention to which fabric to wear where, but this science you spoke would def be good in the northern temps!! Thanks for sharing. It has been a crazy winter. Layering is a good habit to get into for everyone…but it is definitely more imperative the farther north you go. We trucked through the south. I always had to be layering. We would leave home in -20 below and snow and arrive to unload in 60 degrees. My internal thermostat was messed up for months in the winter.